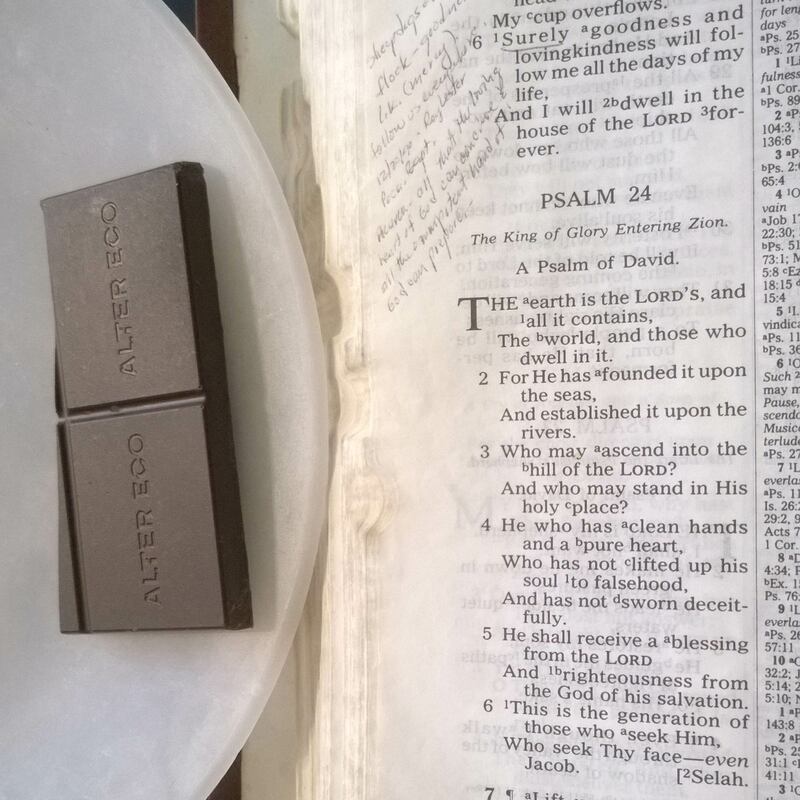 We’ve got another psalm of orientation on our hands today. There are no marauding liars, no sleepless nights: just another song extolling the virtues of the king. But hold on–this isn’t another nationalistic ode to the king of Israel. David’s not talking about himself here, but about the King of the World: the Creator of heaven and earth. God claims his right to the world by virtue of making it. David writes, “The earth is the Lord’s, and all it contains…for He has founded it upon the seas and established it upon the rivers” (1-2). He made it, he laid it down, he put it together; it’s his kingdom. Moreover, he privileges those who remain pure with access to his sacred hill. In one breath David poses and answers the question: “Who may ascend into the hill of the Lord? And who may stand in His holy place? He who has clean hands and a pure heart” (3-4). Those who seek God in purity may come into his presence. 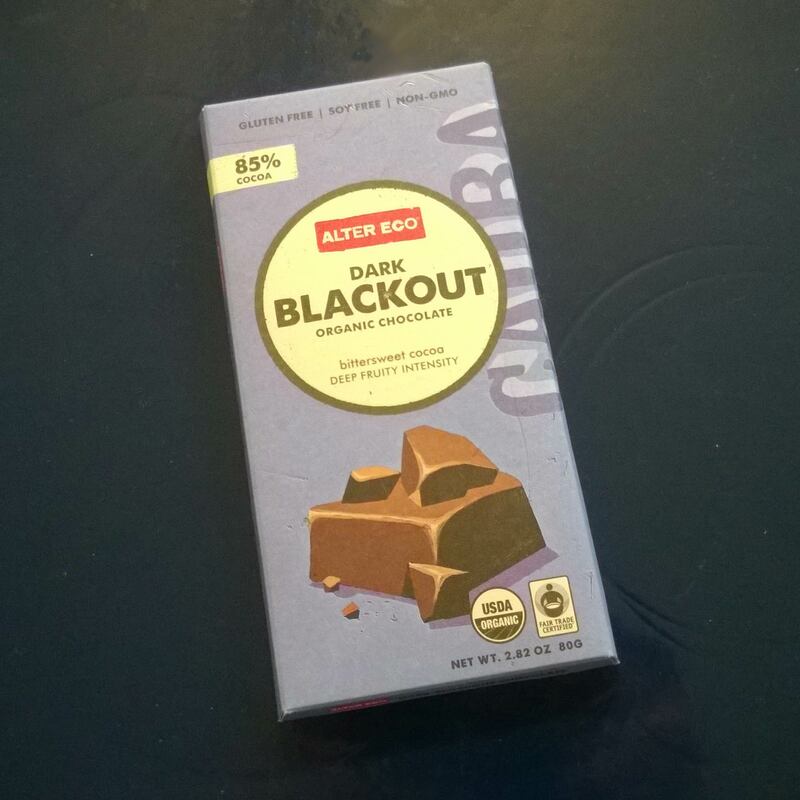 A few notes on the chocolate of the day: while restocking my chocolate this past weekend, I bought two Alter Eco bars for variety, and also because they were on sale, and furthermore also because I like my chocolate ferociously dark. And Alter Eco’s Dark Blackout delivers! My favorite super-dark bar remains Green & Black’s, but Alter Eco is also quite good. If you want to pick up a bar for yourself, just look for the packaging seen to your left. Posted in Daily Reading, Psalms.Tagged authority, bible, christianity, David, God, king, orientation, Psalms, righteousness, scripture, Walter Brueggemann.